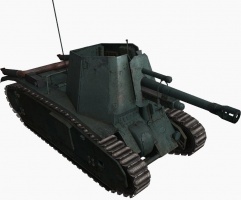 It is the first premium self-propelled gun to be added into the game. Overall, it can be compared to the AMX 13 105 AM mle. 50, since its gun has about the same damage, accuracy, and range. Making a valuable addition to firepower on public matches, but still loses against opponents like the Grille for its unmatched accuracy and damage. Many players will feel right at home using this equipment as it can be very forgiving. 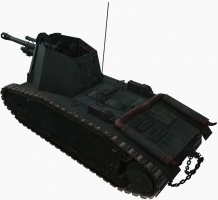 Its relatively thick armour is able to bounce shots from low tier guns, giving it a better defence against light tanks. 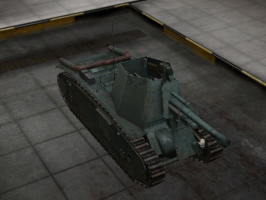 The leFH18B2 also weighs in at almost 33 tons, allowing it to destroy light tanks that attempt to ram it. 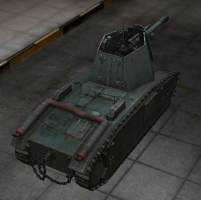 This tank has kept the damage and penetration from before 9.18, making it arguably the most powerful artillery tier-for-tier in the game, even more so after 9.18, assuming it hits it's target. The low splash radius and time to land can be frustrating for players and necessitates that you fully aim shots. 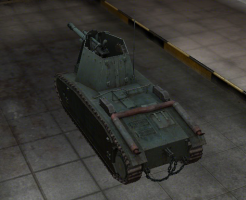 This tank was removed from the in-game store in the 8.6 update. It will be given as special awards during specials and events, as well as sometimes appearing as a special offer in the premium shop, but generally only as a freebie for a package with the highest gold offers. 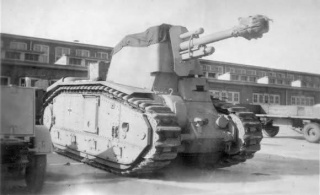 It has gun elevation and depression which enable it to fire behind some rocks and small buildings and will greatly help in self defence when needed. 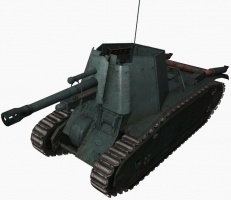 It has the thickest armour of all artillery for its tier, making an exceptionally difficult target to kill by low tier scouts that do not stop and aim at the weaker armoured turret, although, just like the B1, this SPG can be crippled by aiming at the exposed tracks depriving it of movement, but it will take several shots to actually destroy it. 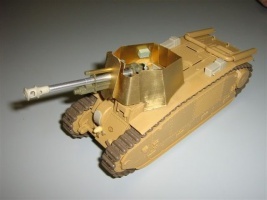 A side effect of its strong armour is that it is nearly impossible to destroy by ramming by lighter vehicles. Light tanks that attempt to do so will instead destroy themselves.. 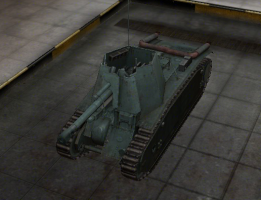 The 105 leFH18B2 does not share the agility or speed of the B1, so relocation and placement can be a problem and has a rather large silhouette in comparison to other SPG's of the same tier, but it can still make good use of the camo net. It has an impressive view range (fully trained crew with BIA and coated optics can exceed 445m even on the move), which can be exploited to use it as a Tank Destroyer in combination with Binoculars, but this should be done only in emergency situations. Keeping a few HEAT rounds for more consistent damage of to use in self defence in shotgun mode can be useful. It can be very threatening to targets that get too close to you. Hitting Small targets can be difficult due to the lack of HE splash damage, just like the AMX 13 105 AM mle. 50. However, its insane rate of fire means you will have multiple opportunities as long as they stay spotted. While the LeFH18B2 does have the lowest damage per shot of its tier, it also has the fastest rate of fire for its tier by a decent margin, which makes up for the lack of splash damage. 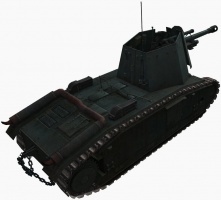 Note that this vehicle cannot Stun due to the low calibre of the gun, but unlike most arty, retains the ability to fire both AP and HEAT (Premium ammo). 105 leFH18B2 was a German 105-mm howitzer self-propelled artillery unit based on a chassis of French B-1 bis tank. 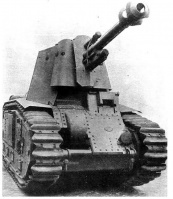 In the early spring of 1941 a decision was made to convert sixteen captured French B1 bis tanks into self-propelled artillery units. 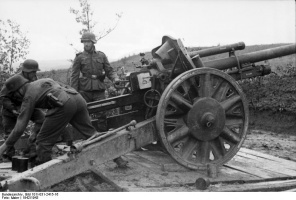 Rheinmetall-Borsig company, which was in charge for the development choose to install leFh18/3(sf) ((German: leichte FeldHaubitze - "light field howitzer"), standard Wehrmacht infantry light howitzer. The weapon was crude, but simple to maintain and very effective. It had a heavy, simple breech mechanism with a hydro-pneumatic recoil system. With a newly installed muzzle brake, it could fire a 14,81 kg HE round to a maximum distance of 10675 meters. Muzzle velocity was around 460 m/s with a rate of fire between 4-6 round per minute. Production of 105 leFH18B2 was launched in late 1941, and by the end of 1942, all planned units were delivered to the troops. 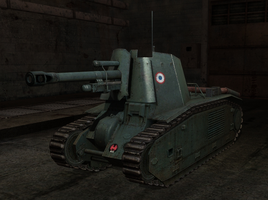 Despite the fact that the 105 leFH18B2 was created by the Germans using captured French tanks, it was placed in French Tech Line in game. This page was last modified on 1 February 2019, at 02:43. This page has been accessed 216,128 times.